Gordon Bitner Hinckley was the prophet of The Church of Jesus Christ of Latter-day Saints (which is frequently misnamed the Mormon Church) from March 1995 until his death on January 27, 2008. During the administrations of his predecessors Spencer W. Kimball, Ezra Taft Benson, and Howard W. Hunter, President Hinckley performed many of the duties of the Church’s presidency when these men were ill. As president of the “Mormon Church,” he was considered by faithful Mormons to be a prophet, seer, and revelator of God’s will on behalf of humanity. Hinckley also once served as Chairman of the Church Board of Education and the Board of Trustees that govern the Church Educational System. Gordon B. Hinckley was born in Salt Lake City, Utah, on June 23, 1910. As a child, Hinckley was very sickly. He struggled with severe asthma and allergies, and so his family moved out of downtown Salt Lake City to the more rural East Millcreek area of Salt Lake City. He grew up on that farm, and his health improved. In 1928, he completed high school. After attending the University of Utah, he was called to go on a mission to London in 1933, an unusual occurrence for Depression-era Mormons, as few could afford to serve as Mormon missionaries. Hinckley returned to the United States in 1935 and soon accepted a job offer to lead the Mormon Church’s new public relations department (he had studied English and Journalism in college). Hinckley’s responsibilities included developing the Mormon Church’s fledgling radio broadcasts and making use of the era’s new communication technologies. Starting in 1937, he served on the Sunday School General Board. On April 29, 1937, he married Marjorie Pay (November 23, 1911–April 6, 2004). They had been married 67 years at the time of her death. After service in a stake presidency, he became a General Authority of the Mormon Church in the now-discontinued-position of Assistant to the Quorum of the Twelve Apostles in 1958. In 1961, he himself became an Apostle and member of that Quorum, the youngest at that time. In the early 1980s, the ill health of both Church President Spencer W. Kimball and his aging Counselors N. Eldon Tanner and Marion G. Romney led the Church leadership to resort to the occasional practice of adding an additional counselor to the First Presidency of the LDS church, and Hinckley filled this position on July 23, 1981. At the time of Tanner’s death in 1982, Romney succeeded him as First Counselor and Hinckley succeeded Romney as Second Counselor. During this time period, there were a number of questionable, new Mormon historical documents that began to surface, and Gordon B. Hinckley oversaw the purchase of some of these documents. Later, most of the newly-surfaced documents turned out to be forgeries of Mark Hofmann, including the Salamander Letter. Because of his prominence in the Church and his responsibility to oversee the purchase of historical documents, Hinckley became a key figure in the investigation of Hofmann. By this time, however, Hinckley was largely shouldering the burdens of the First Presidency by himself. Though he officially remained Second Counselor, he was informally referred to in the press as “acting President of the Church.” Kimball and Romney remained largely out of the public eye until President Kimball died in November 1985. Longtime President of the Quorum of the Twelve Apostles, Ezra Taft Benson, became Church President, and named Hinckley First Counselor. Romney succeeded Benson as President of the Twelve, though he never exercised the duties of this position. Thomas S. Monson became Second Counselor, and, for a while, all three members of the First Presidency were able to perform their duties. In the early 1990s however, Ezra Taft Benson developed serious health problems that removed him from public view, and First Counselor Gordon B. Hinckley again carried out many of the duties of the President of the Church until Benson died in 1994. Howard W. Hunter, who had succeeded Romney as President of the Twelve, became Mormon Church President and set apart Hinckley and Monson as his Counselors, Hinckley additionally becoming President of the Twelve by seniority. And when Hunter died after a presidency of only nine months, Hinckley was chosen to be president of the Mormon Church at the age of 84 (his two predecessors had both acceded at age 86) after being unanimously sustained by members of the Quorum of the Twelve. Hinckley is known for his extensive building of Mormon temples. Under his leadership, the Mormon Church has expanded the number of temples worldwide from 27 to 136 (as of April 2012, with 15 under construction and another 15 announced, though some of these were built after Hinckley’s death). In 2000 alone, more Mormon temples opened (34) than existed at the time of Hinckley’s calling to the First Presidency. Over two-thirds of all Mormon temples currently in operation were dedicated by Hinckley. He has also overseen other building projects, like the LDS Conference Center. On 23 September 1995, Hinckley announced and read The Family: A Proclamation to the World, a statement of belief and counsel prepared by the First Presidency and Quorum of the Twelve of the Mormon Church. This was followed by another proclamation in 2000 called The Living Christ, which contains the testimony and teachings of the Mormon Church about the Savior, Jesus Christ. On 31 March 2001, Hinckley announced the Perpetual Education Fund, a large endowment that provides loans to students in developing nations. It is funded entirely by donations, with the assumption that students will pay back into the fund when they are able. This concern for the poor and the importance to help others in helping themselves has been a theme of Gordon B. Hinckley’s work. He has greatly expanded the Mormon Church humanitarian efforts throughout the world and has been personally involved in many disaster relief and service projects. On January 24, 2006, Gordon Hinckley underwent surgery to remove cancerous growths in his large intestine. According to Deseret News, the procedure went well and a rapid recovery was expected. He was released from the hospital on January 31. On March 10, 2006, Hinckley traveled to Santiago, Chile, to rededicate the Mormon temple there. He told the Chileans that it was likely he wouldn’t get back to see them again. Less than a month later, he presided over General Conference. Some speculated he was in bad health because he did not give the opening address. These speculations were soon debunked when a stern and strong Hinckley gave the concluding talk of the Priesthood Session. On June 23, 2006, on his 96th birthday, Hinckley participated in a groundbreaking ceremony at BYU for a new building to be named in his honor. The building is called the Gordon B. Hinckley Alumni and Visitors Center. Gordon B. Hinckley has been described as the most-traveled Mormon Church leader—past or present, having traveled millions of miles over the years to fulfill assignments. In spite of his advanced age, he continued to travel the world over as he dedicated temples and met with the Saints. Up until the age of 95 and his cancer surgery, he had spent only one night in a hospital in his life. He was a man with remarkable vigor for his age. President Gordon B. Hinckley was exceptionally influential in the growth of the Church throughout the world as he has met with diplomats in his travels. His 60 years of public relations experience and his natural ability to be warm and friendly served him well when he was in the spotlight. His expression of love for all people, regardless of race or religion, won him many friends around the world, enabling the Mormon Church to become an international institution. He was the recipient of a number of educational honors, including: the Distinguished Citizen Award, from Southern Utah University; Distinguished Alumni Award, from the University of Utah; and honorary doctorates from Westminster College, Utah State University, University of Utah, Brigham Young University—Idaho, Brigham Young University, and Southern Utah University. He received the Silver Buffalo Award of the Boy Scouts of America and was honored by the National Conference (formerly the National Conference of Christians and Jews) for his contributions to tolerance and understanding in the world. 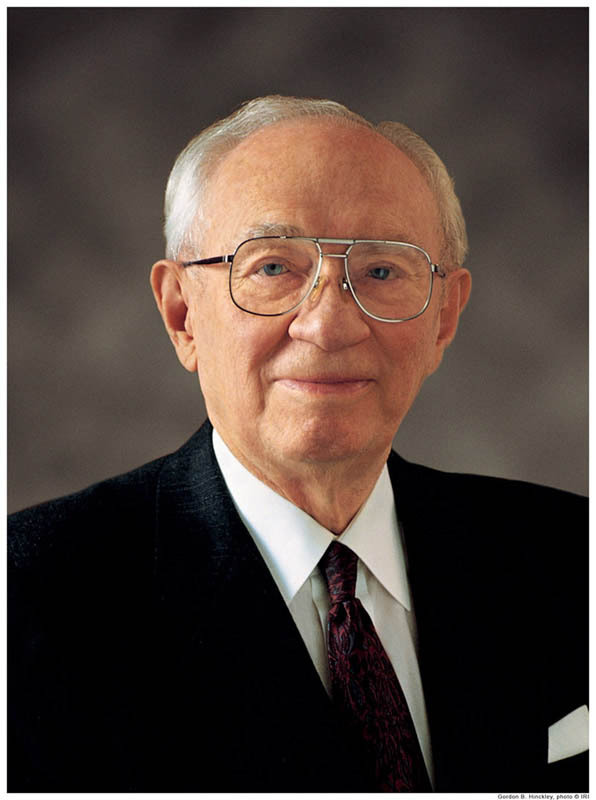 Gordon Bitner Hinckley passed away on January 27, 2008, at the age of 97. He was a beloved man and leader. Anita Stansfield began writing at the age of sixteen, and her first novel was published sixteen years later. For more than fifteen years she has been the number-one best-selling author of women’s fiction in the LDS market. Her novels range from historical to contemporary and cover a wide gamut of social and emotional issues that explore the human experience through memorable characters and unpredictable plots. She has received many awards, including a special award for pioneering new ground in LDS fiction, the Lifetime Achievement Award from the Whitney Academy for LDS Literature, and also a Lifetime Achievement Award from her publisher, Covenant Communications. She has fifty-six published books. Anita is the mother of five, and has three grandchildren.